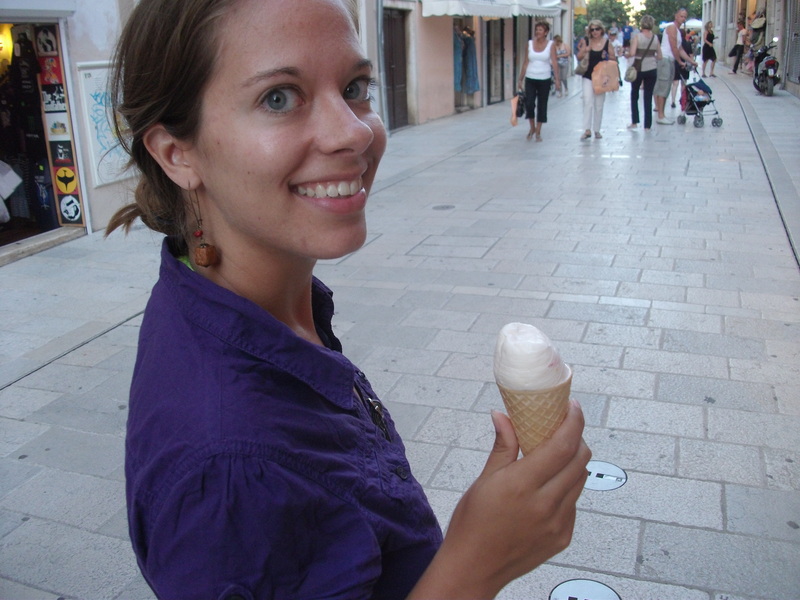 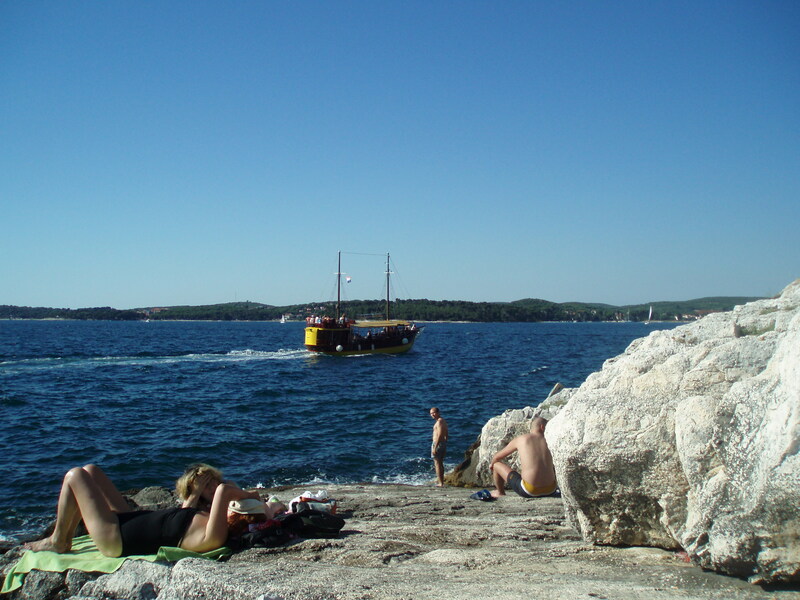 Yesterday we took a day trip to Pula and Rovinj (pronounced Roveen). 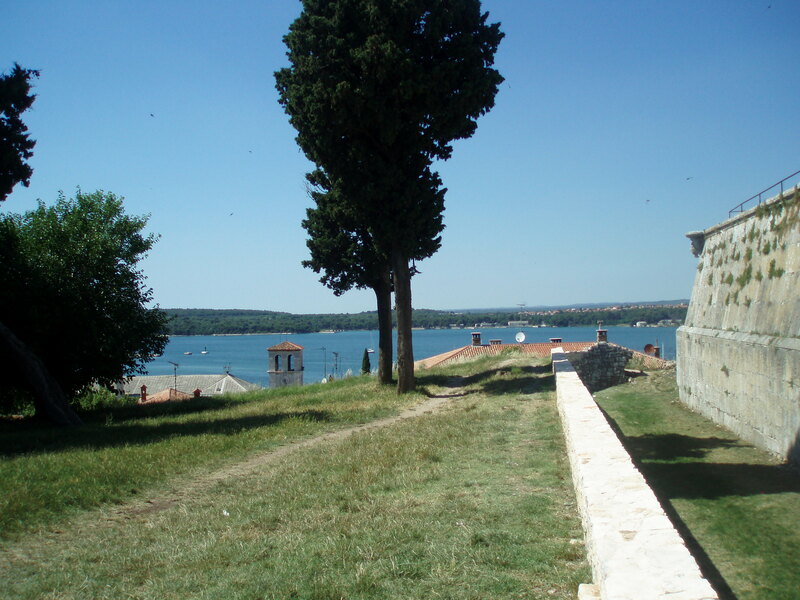 It was about a two hour ride to Pula which is the southern-most city in Istria and one of great historical importance. 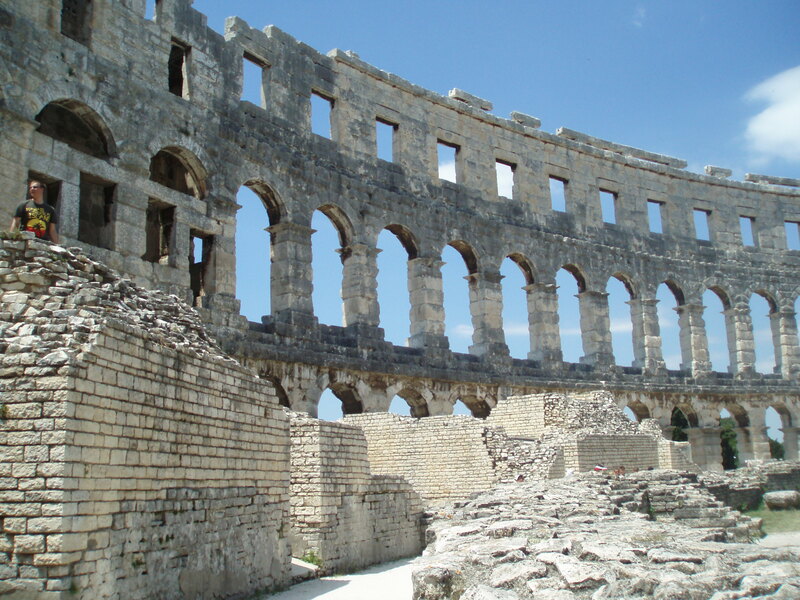 Pula’s location at the end of the Istrian peninsula made it geographically important to the Roman empire for the import and export of goods. 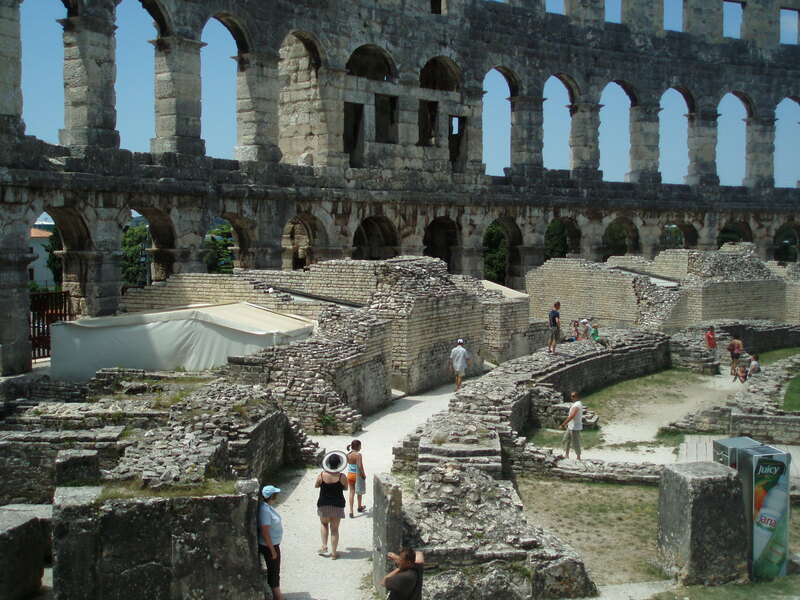 It has since remained an important memorial to Roman times as there are quite a few ruins still preserved. 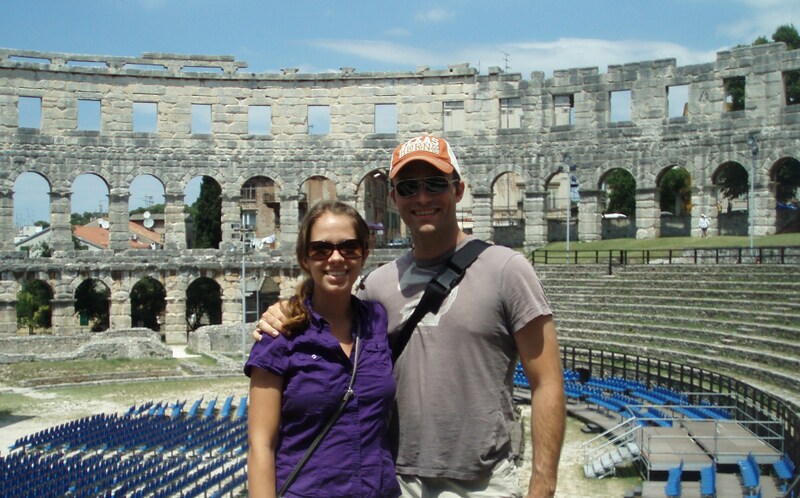 Once we arrived we bought a map to orient ourselves and then headed in the direction of the Roman amphitheater. 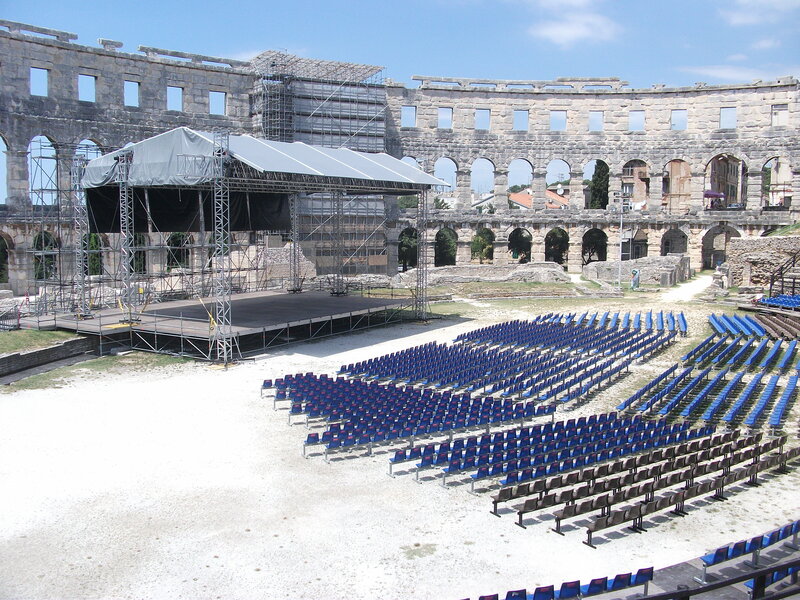 The arena in Pula is the 6th largest Roman amphitheater in the world and is still used as a venue for concerts and plays. 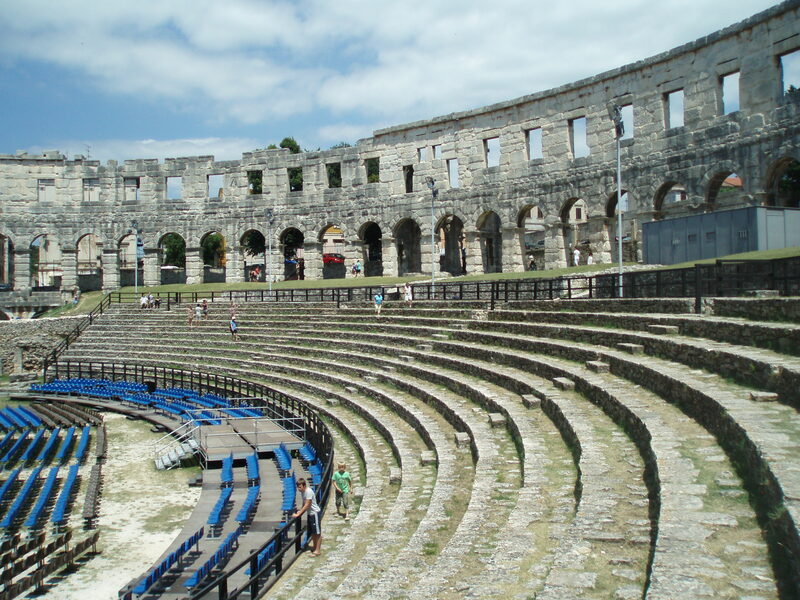 But in Roman times this arena was in fact used for gladiator battles, among less interesting acts. 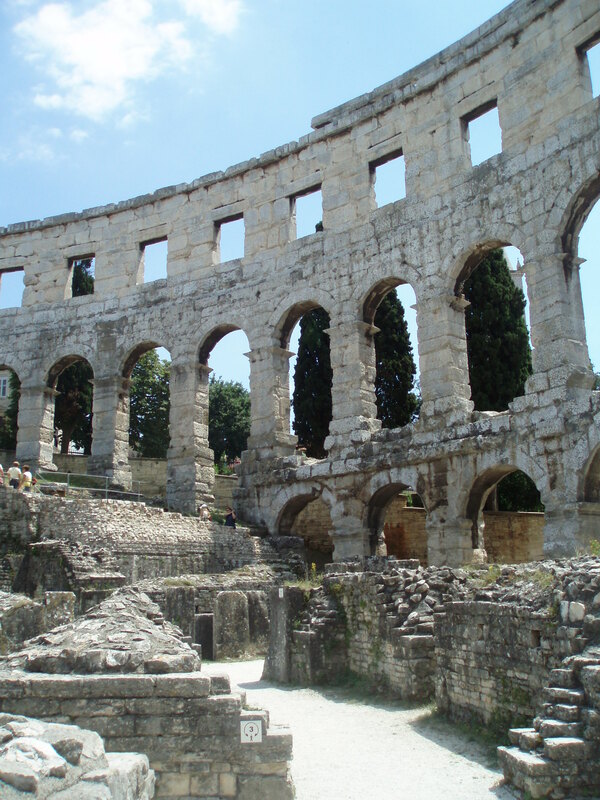 A lot has changed over the years – there are plastic chairs on the arena floor for audiences and a large stage was set up with lights and speakers – but it was still easy to visualize an arena packed with Romans shouting and cheering for the favored gladiatorial outcome. 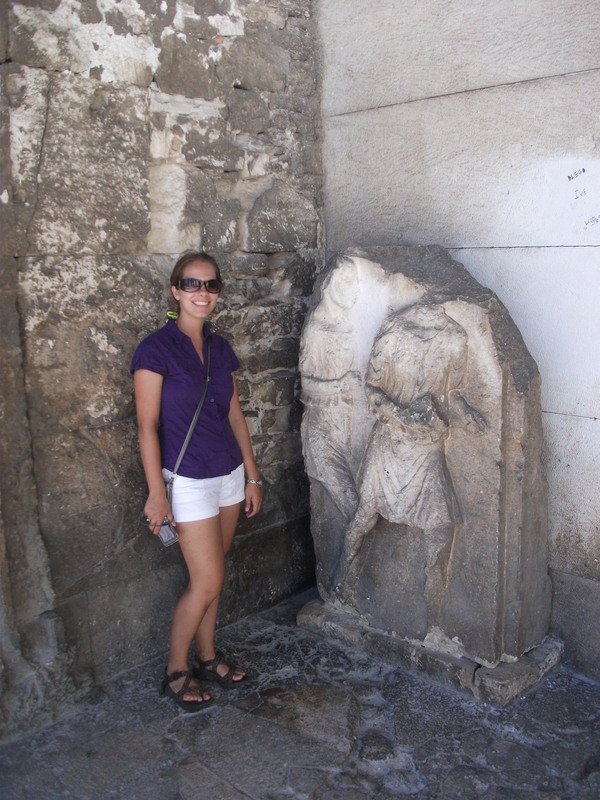 We had the opportunity to go under a section of the arena floor for an exhibit; it was an area where previously the gladiators, animals, or wounded/killed gladiators would have been held – which area it had been was not made clear. 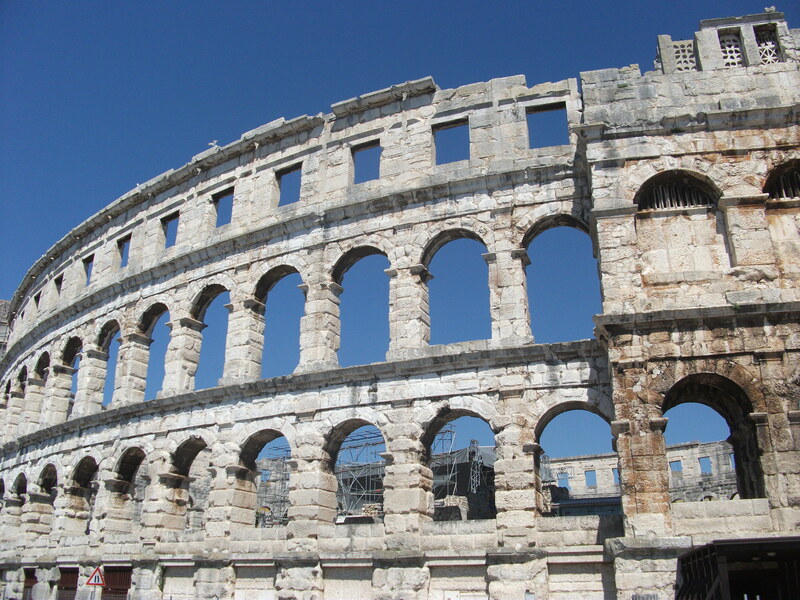 After we left the arena we walked about Pula’s centre to find some of the other notable Roman ruins. 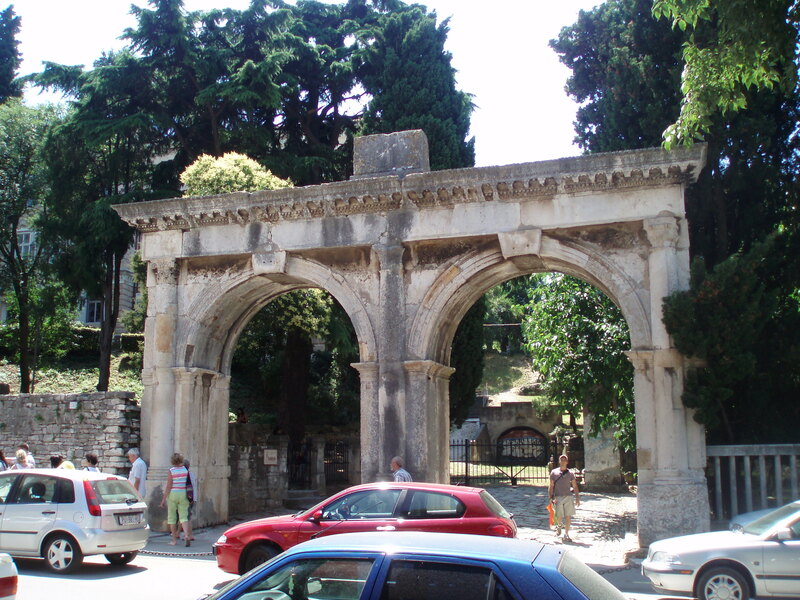 We saw Hercules’s Gate – he was the patron god of ancient Pula – which has been damaged and rebuilt numerous times throughout history. 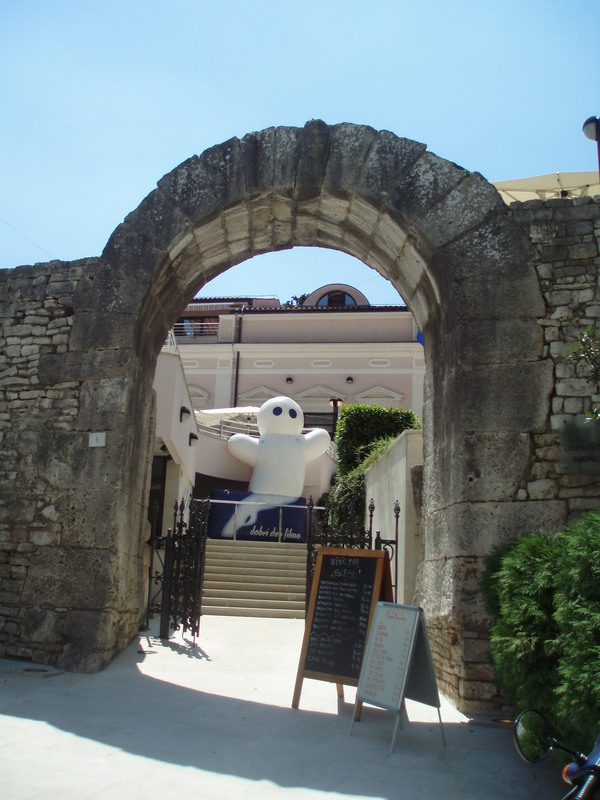 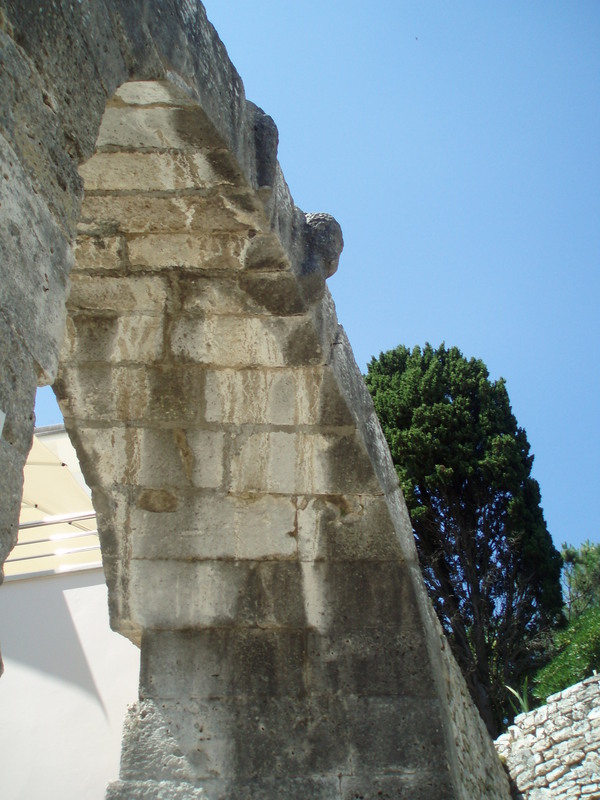 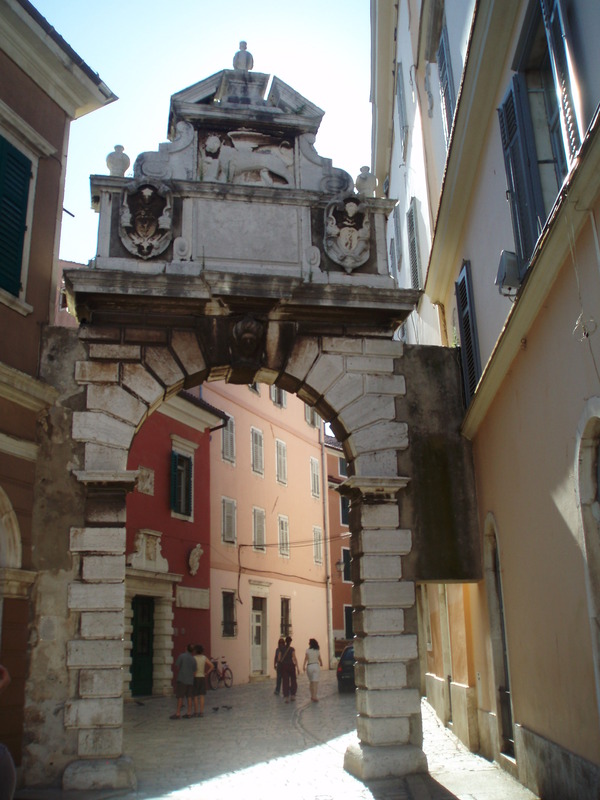 It was one of the gates through which one could gain access through the old Roman walls of Pula. 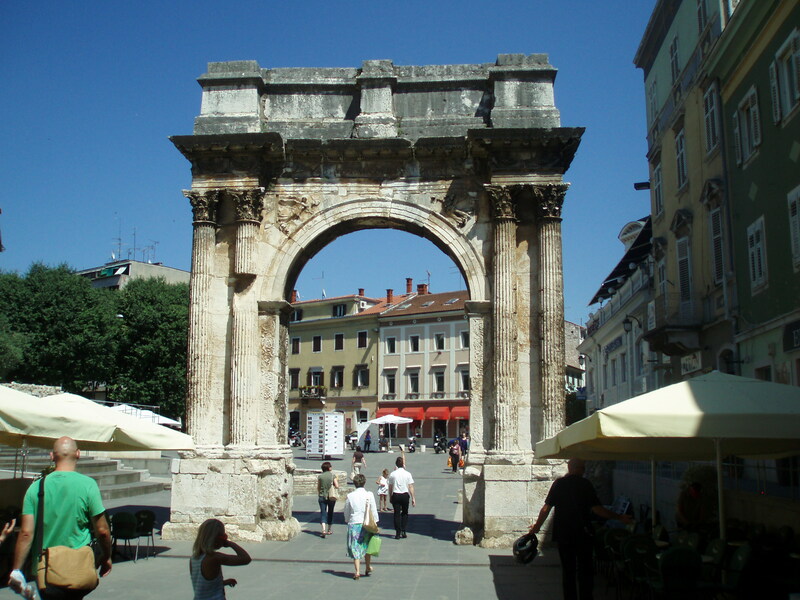 We also saw the Golden Gate, a triumphal arch, which once stood with the city gate and walls, but is now the only remainder. 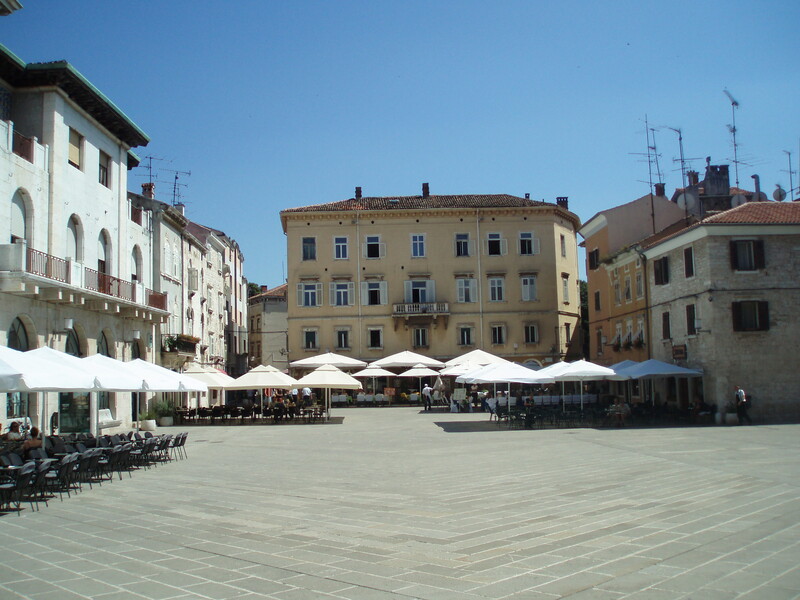 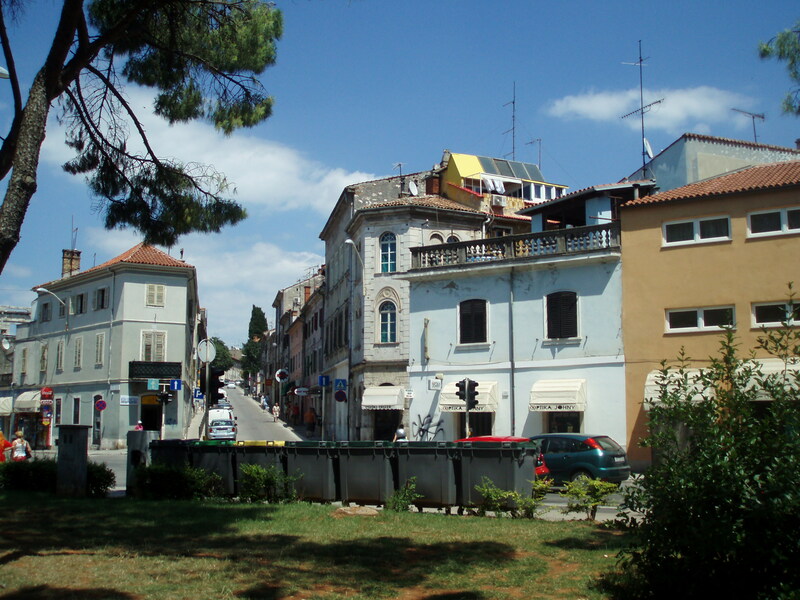 Pula has also retained the forum which was the political, religious, and commercial center of ancient Pula. 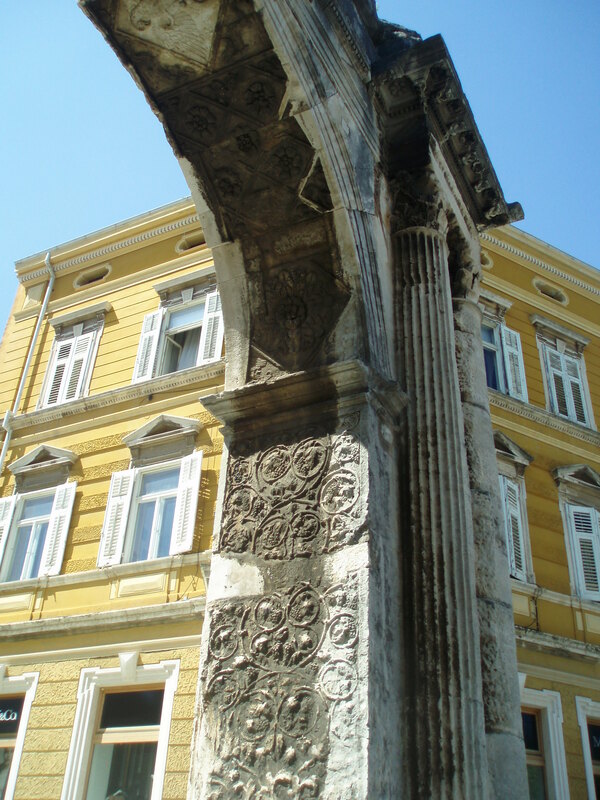 In the forum (or square) stands the Temple of Augustus. 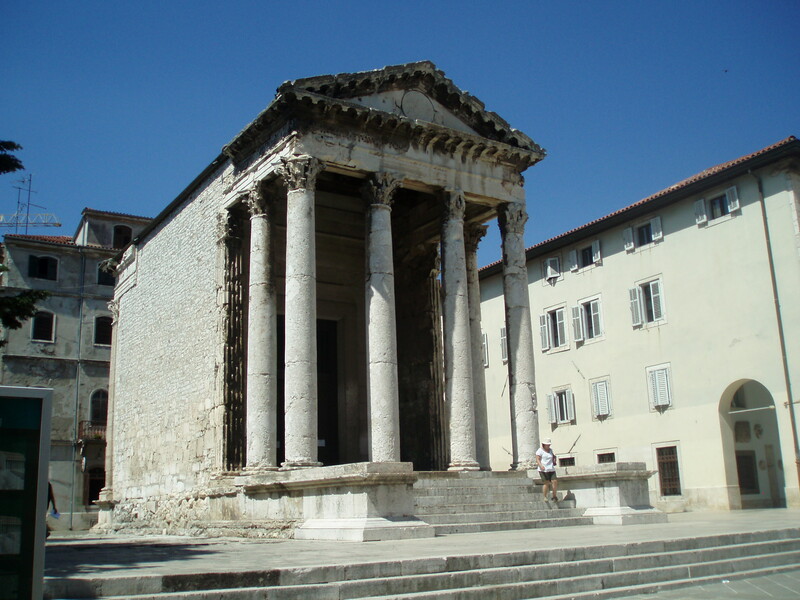 It is the only fully preserved temple in the forum today. 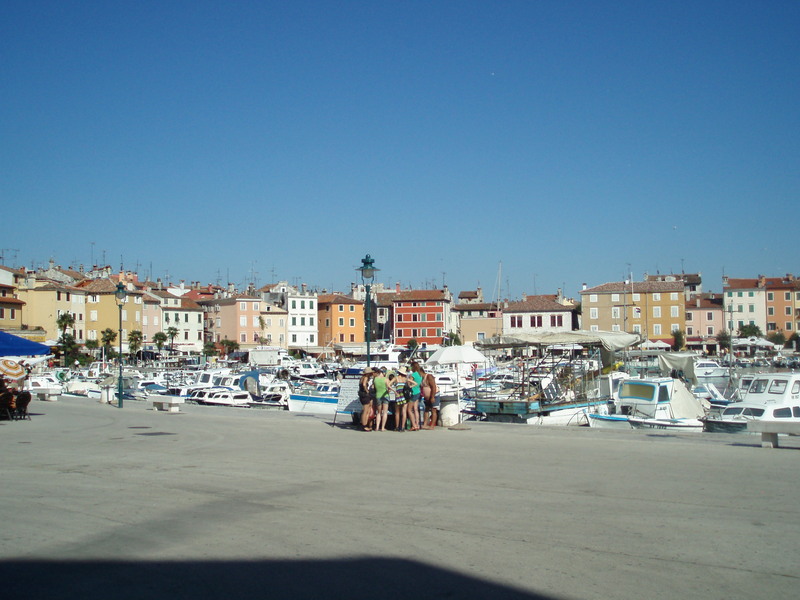 We left Pula and headed toward Rovinj, the halfway point on our journey back to Poreč. 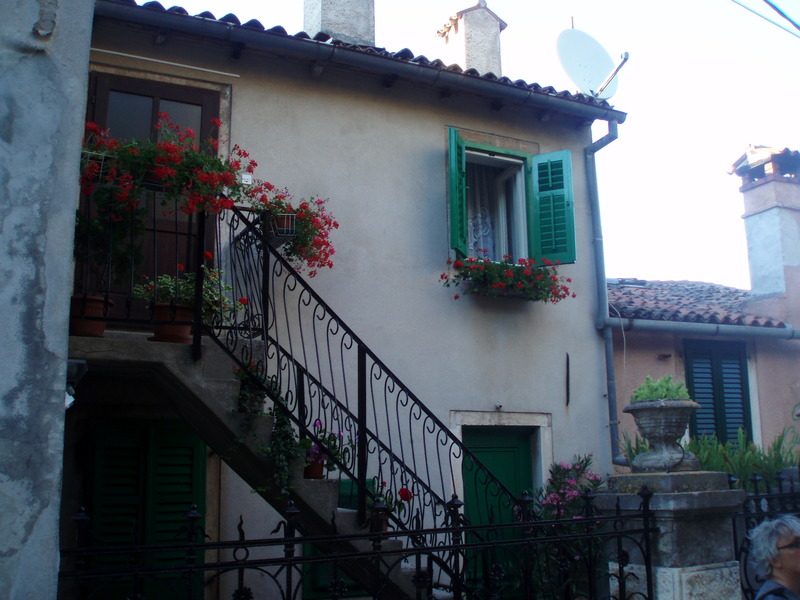 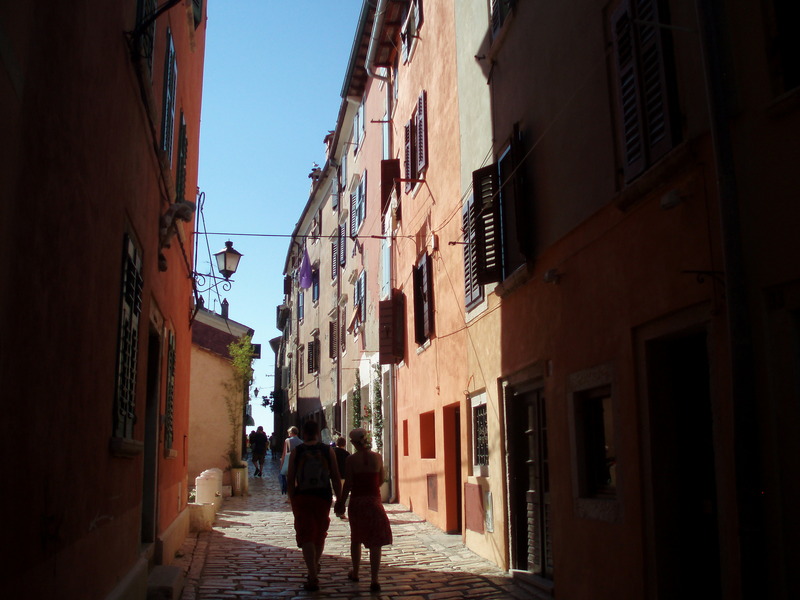 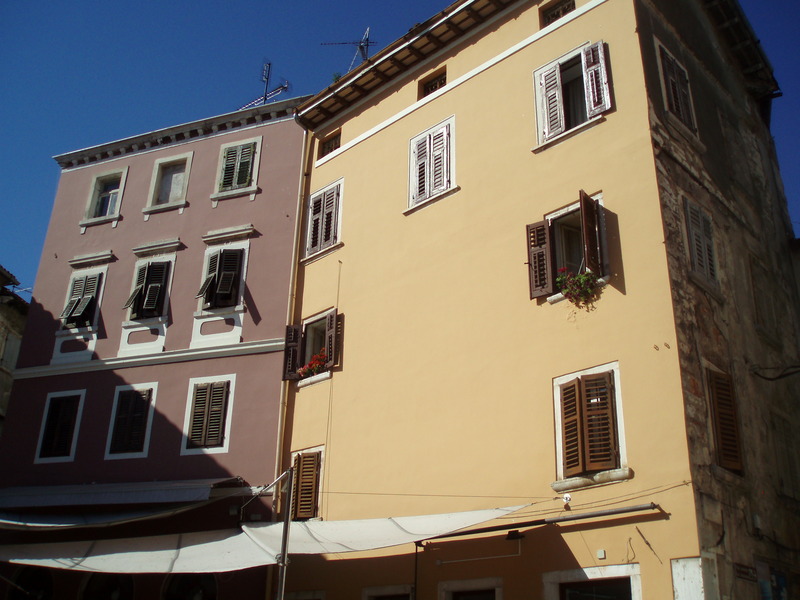 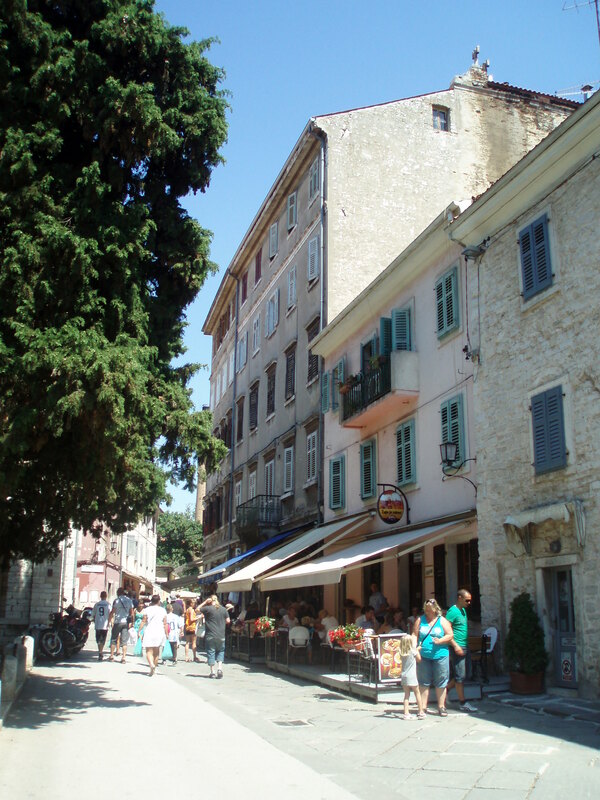 Rovinj’s centre is a circular peninsula with small, quiet streets that appear almost as alleyways. 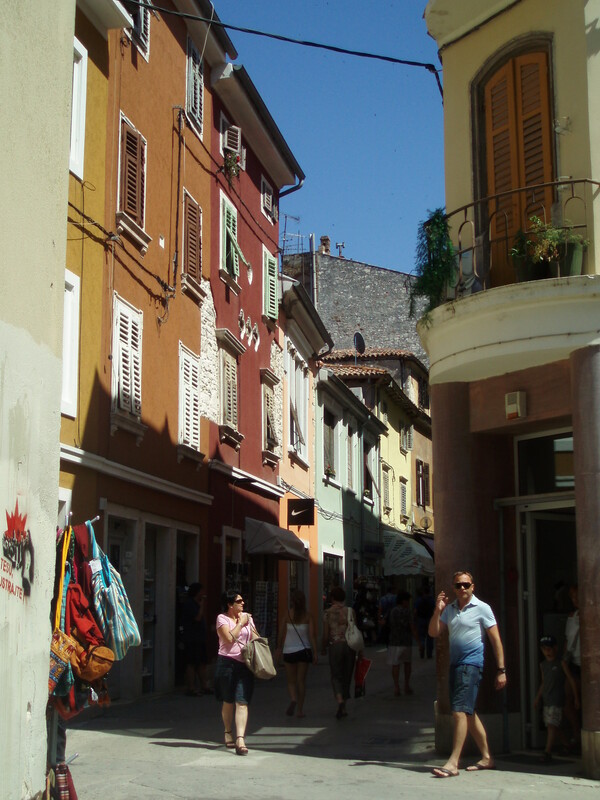 It’s a gorgeous little town. 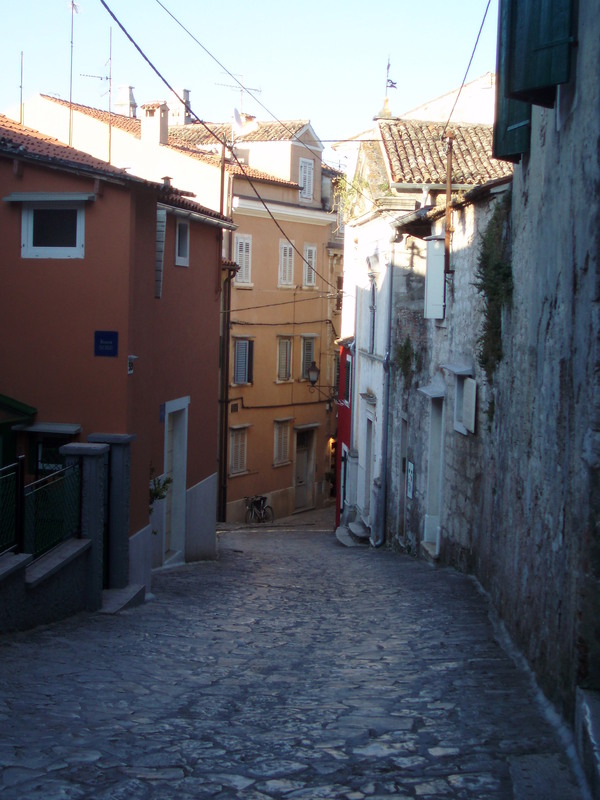 We instantly fell in love with the colors, the solitude, and the intimacy. 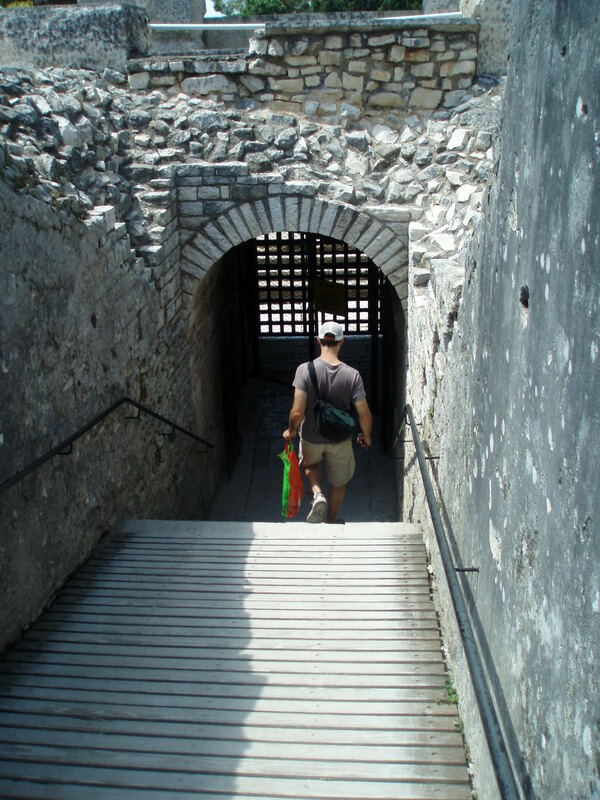 It’s a popular tourist town, but there are so many various passageways it was easy to find ourselves with only 3 or 4 other people. 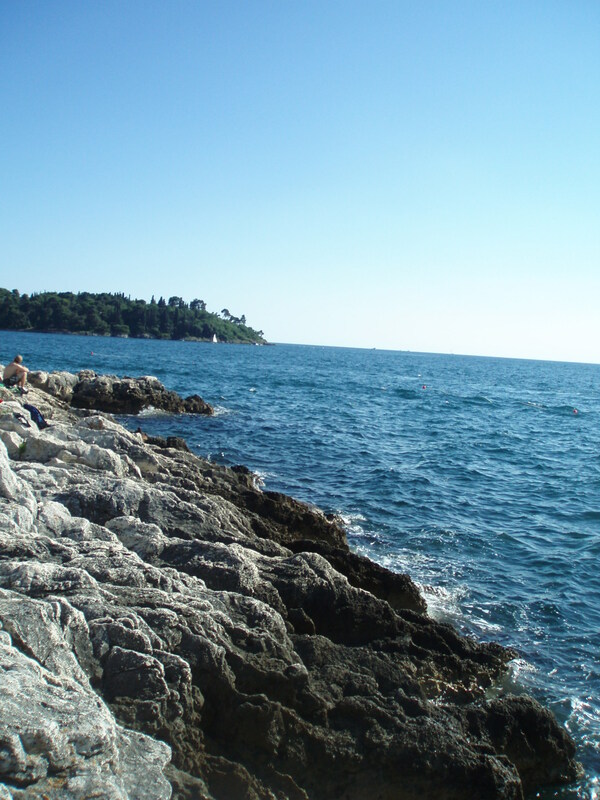 We walked through the centre in search of a place to swim and discovered a sunny spot away from the more populated areas. 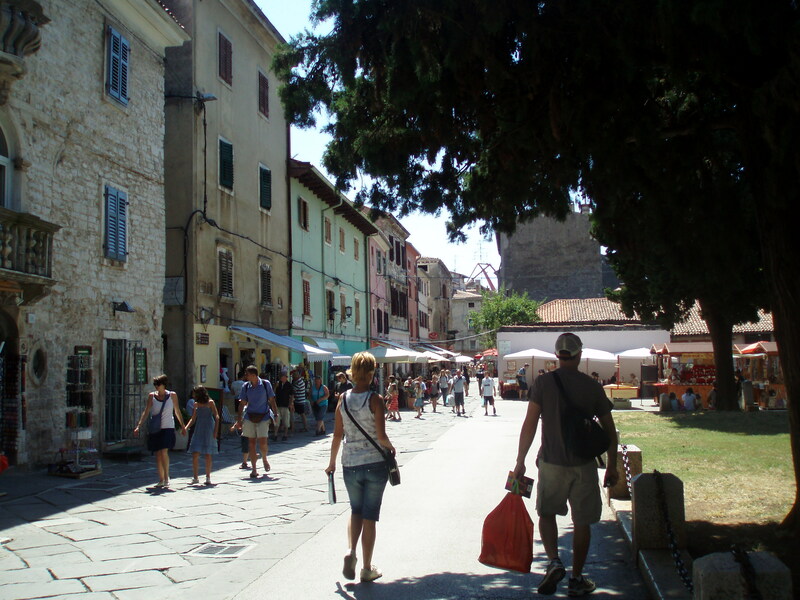 We stayed for a few hours before packing up and walking toward the bus station. 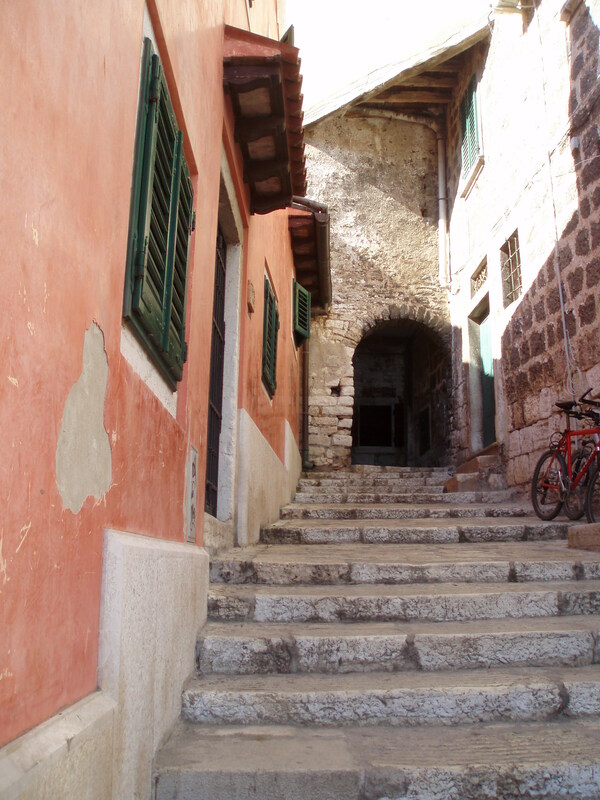 It was around dusk, but the sun was full and the breeze cool. 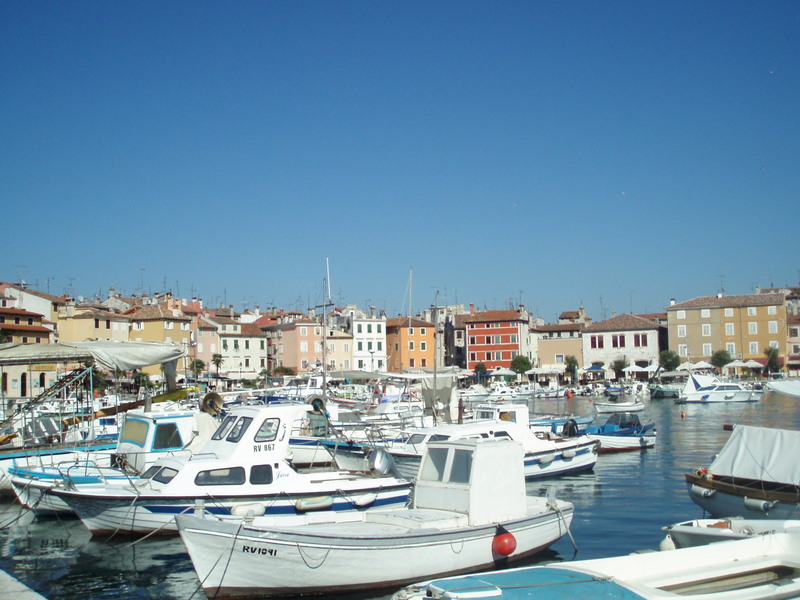 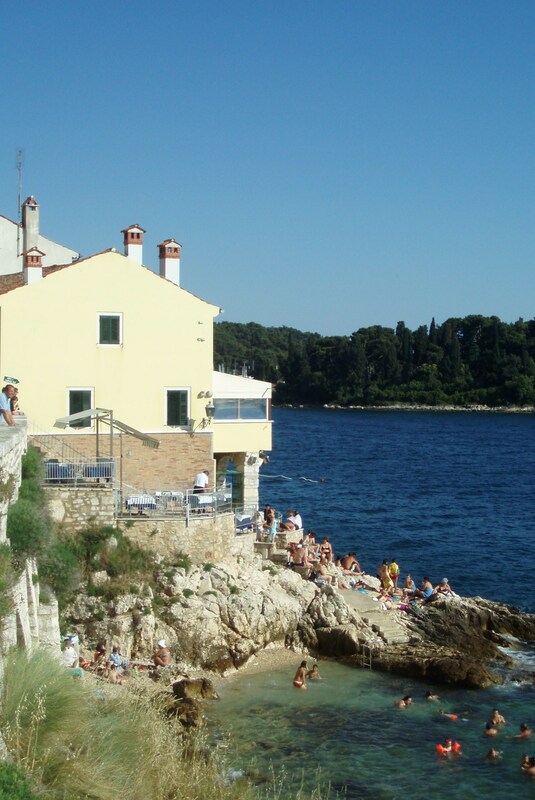 We really enjoyed our short time in Rovinj and next time it may be our sole destination.